The theme of this scene cannot be found in the gospels. But Jesus must have experienced this state of mind. We know this moment also from our own experience: turning inwards to find ourselves again, isolation, not so much panic as melancholy, the realization of the irreversibility of the course of events. Amazement more than anger. Loneliness rather than relationship. Resignation more than resistance. Sculptures of ‘Christ on the Cold Stone’ incite us to compassion and imitation of the suffering Christ. 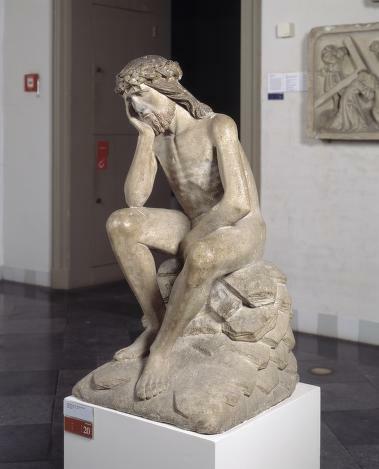 The mourning Christ leans with his head on his hands, sometimes his hands are tied. In the Netherlands there are only three comparable sculptures dating from around 1500: in Horst, in Neede and in Zeevenaar. Christ on the Cold Stone, limestone, 98 x 49,5 x 48,5 cm. Originating from the east of The Netherlands (1500-1520), preserved in the Church of Holy Matthew in Azewijn. Maria H.A. ter Steeg-van Wayenburg is a theologian who worked for Catholic television and as a pastoral counsellor. From 1994 to 2008 she was a member of the staff and board of the archbishopric Utrecht.